Brick is beautiful. It’s strong, weather-resistant and durable. So durable, in fact, that ancient structures made from mud bricks almost 10,000 years ago have been found throughout the Middle East. Brick can be commonly found throughout New England in buildings ranging from more than a century old to new construction. The type of brick construction used has also changed dramatically over the years. In spite of its durability, masonry – brick and the mortar that holds it in place – must be maintained to ensure that it provides protection from the elements, preserves its structural integrity and remains aesthetically pleasing. Masonry restoration also plays an important role in protecting or enhancing the value of a property. Brick is compromised over time; as it ages, it allows moisture to enter the structure. If this continues without being addressed, it will lead to substantial structural damage and require replacement. The cost of replacement will be much higher than if the masonry were properly maintained. Over time, masonry may need to be cleaned, pointed, sealed or even replaced. The brick itself may still be strong, but the mortar that holds the bricks in place will need to be re-pointed, this requires grinding out the existing mortar and repointing it with new mortar. The primary purpose of pointing is usually waterproofing. Pointing also helps retain the structural integrity of the masonry, but if the integrity of a structure is already weak, pointing will not help. Determining the mortar to use when pointing is especially important, as it should match the existing mortar color and joint profile. The joint is the area between bricks where mortar is placed. Mortar consists of sand, lime and cement; the formulation used will determine how hard the mortar is when dry. In pre-World War II structures, lime mortar was used with little if any Portland cement in the mix. Since then, a harder mortar with less lime has been used, but more recently the trend has been to use a softer mortar, which provides a better seal against the elements. Pointing is an important step for protecting a building, but it is often necessary to take other steps. For example, installation of thru-wall flashing may be needed to stop moisture penetration. Thru-wall (or through-wall) flashing is most often used in buildings constructed in the latter half of the 20th century. These buildings typically used a brick veneer, with a cavity between the interior sheathing and the brick. Thru-wall flashing is typical placed at transitions between horizontal and vertical areas. When moisture enters a wall, thru-wall flashing diverts it back to the outside, preventing potential damage. If there are bowed or unsound areas, they need to be selectively rebuilt, or demolished and replaced. Lintels may also need treatment or replacement. A lintel is a horizontal support of timber, stone, concrete or steel across the top of a door or window. There is an art to masonry restoration. To avoid irreparable damage to your masonry, it’s important to retain a qualified contractor with a good reputation. While pressure-washing can be used to clean brick, for example, if the brick is old and in poor condition, pressure-washing may cause damage. Chemicals or abrasives are also used to clean brick, but either can cause damage in the wrong hands. Some contractors may also use a clear masonry sealer to prevent moisture penetration. While using a sealer is an inexpensive way to treat a moisture problem, it is not a permanent solution and must be reapplied regularly. Sealer may also not address any voids in the mortar joints. If your property is in a location that is exposed to excessive sunlight, UV rays may cause the sealer to break down. If your masonry has degraded to the point where moisture is penetrating through the mortar, a sealer will not help and should not be used. Regulations must also be considered. Local permits have to be obtained and, depending on the building, the local historical commission may become involved. Regulations are generally less stringent for reconstruction and some building code standards are grandfathered in, so they may not apply during reconstruction. However, competent contractors will take all regulations into consideration and ensure that any project is structurally sound and built to last. The means and method of construction have to comply with the state building code, and federal regulations issued by the Occupational Safety and Health Administration (OSHA) and the Environmental Protection Agency (EPA). OSHA regulates worker safety, such as how equipment is set up, use of respirators and other factors. OSHA requires that a limited access zone be established whenever masonry work is taking place. The zone has to be equal to the height of the wall being reconstructed, plus four feet, and it has to run the entire length of the wall. OSHA also requires adequate bracing of masonry walls. EPA regulations cover everything from the generation and containment of dust during reconstruction to disposal of wastes considered to be hazardous, such as cement, sealers and building materials. In older buildings, the presence of asbestos has to be considered. While a building may be grandfathered in and not have to comply with current building standards, coming up to code may be necessary as a safety precaution or if a building is being renovated. If lead paint is present, for example, remediation will be required. Retrofitting a masonry building to meet these standards may require that all floors and roof lines be tied to the masonry, and that they be reinforced to meet current load-bearing requirements. Like Massachusetts, many other states have similar standards that are often based on or even exceed those of Chapter 21 of the International Building Code. 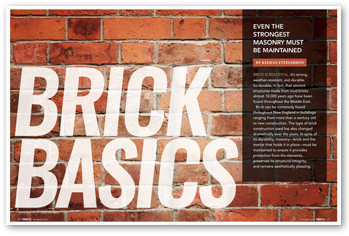 The Brick Industry Association also issues periodic technical notes with updates covering changes in standards. Masonry is also subject to minimum building standards in ACI 530/ASCE 5/TMS 402, produced by the American Concrete Institute, the American Society of Civil Engineers, and The Masonry Society. The masonry building code covers the design and construction of masonry structures including definitions, contract documents, quality assurance, materials, placement of embedded items, analysis and design, strength and serviceability, flexural and axial loads, sheer, details and development of reinforcement, walls, columns, pilasters, beams and lintels, seismic design requirements, glass unit masonry, veneer, and autoclaved aerated concrete masonry. In addition to the code, standards include masonry specifications (ACI 530.1/ASCE 6/TMS 602) covering requirements for materials; placing, bonding and anchoring of masonry, and placement and reinforcement of mortar. During masonry restoration, structural engineering specifications, aesthetics and the integrity of the building all need to be considered. It takes knowledgeable, experienced craftsmen to address all of the issues necessary for a successful restoration project. Kieran Fitzgibbon is co-owner of Statewide RM of Brighton, Mass., which specializes in masonry restoration for condominiums. He can be reached at kfitzgibbon@statewiderm.com.